Towson split its two matches at home this weekend, rallying to beat UNCW 3-2 Saturday after losing 3-1 to College of Charleston Friday. The Tigers rallied from being down 2-0 to win three straight sets and take the match 3-2 over the Seahawks in SECU Arena. Leading the way for the Tigers was senior Julymar Otero. She recorded 12 kills, 28 assists and 18 digs. This marked Otero’s fifth triple-double of the season, which ranks her second in the nation. Junior Jocelyn Kuilan, redshirt junior Anna Holehouse and sophomore Marrisa Wonders also performed well for Towson. Each recorded double-doubles in the match. Kuilan had 19 kills and 13 digs, Holehouse had 12 assists and 25 digs and Wonders had 38 assists and 20 digs. Wonders leads the team in double-doubles this season with 13. Against the Seahawks, the Tigers were pushed to five sets for just the second time this season, previously winning against Oakland on Sept. 16. The Tigers also finished with 100 digs in a match, the first time they’ve reached triple-digit digs since their 103-dig match against the Blue Hens in 2015. 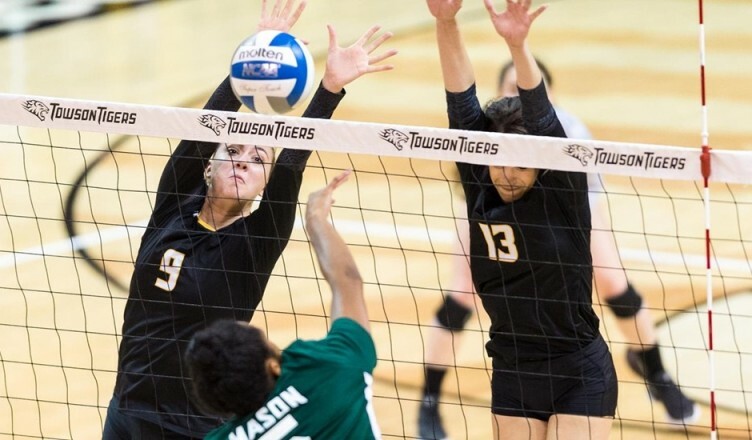 On Friday night, Towson suffered a 3-1 loss to the College of Charleston at SECU Arena. Kuilan and sophomore Olivia Finckel had strong performances in the defeat, as they combined for 28 kills. Wonders also recorded her 12th double-double of the season, with 29 assists and 11 digs. Monday night, Towson hosts James Madison at 7 p.m. in SECU Arena in its third match in four days. The two teams faced off earlier this season, with Towson winning 3-1. This match is also a battle for third place in the CAA, and a higher seed in the upcoming conference tournament. Following the James Madison match, the team closes out the regular season at home against Delaware on Sunday, Nov. 12, at 1 p.m.